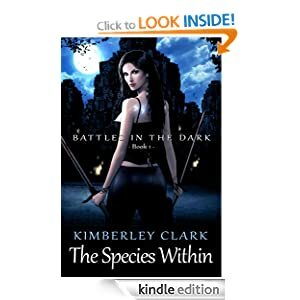 The Species Within (Battles in the Dark). Kimberley Clark. So, vampire type paranormals and romance – that’s me hooked 🙂 or so I though..in fact I struggled quite a lot to begin in getting to grips with this book. That’s partly because Kimberley has taken the traditional vampires and werewolves, and extended them into something more. Throw in Kira a human whose not human, or at least has supernatural powers, and I was a bit lost. There were so many types of creature, and each of them against the other and with typically paranormal names, that I got quite confused and needed to keep flipping back to see who was what, and who was their enemy. About 30% in it began to gel and I found I enjoyed the book much more. I liked the way Kira began so gradually to trust Kuron and Emmerich, despite hating what they were at the start. She slowly starts regarding them as people, disregarding the species part, and focussing on them as individuals. Behind that though is her lifelong distrust, so its naturally a slow process. That worked for me, I find it hard when stories have someone like Kira falling instantly in love with a type of person they’ve always hated. Kira cautions herself all the while, and tells herself its natural surface attraction to a handsome creature – that its not real, and constantly reminding herself what they are. The way she and Kuron were brought into the expedition too worked well, almost against their will as a lesser of two evil options. I don’t like easy success or quick fix answers, so when there were problems along the way I enjoyed how they lost people – it made it more real ( its a book, I don’t like people really dying !!) It was clear early on that she, Emmerich and Kuron has qualities that would e useful in the battles including the ability to cast spells. The journey feels very real, with snippets of the mundane, like blood-bags for the Vanatre, and the differing needs between her and the others for food, toilets and sleep bringing the story to life. Its the minutiae details like that which make a difference for me very often. They make characters seem more real that just flat, fictional creations.